Today’s face: Nathaniel, inspired by Sktchy. So here’s Nathaniel again for the final day of Sktchy’s January 30 Faces 30 Days Challenge. My Day 1 portrait of him was with Copics because that’s my comfort zone. This is watercolour because I’m in no doubt that that is where I’ve improved the most over these 30 days. I do a portrait every day anyway but this month I’ve been pushed to try new things, to step well outside my comfort zone and I’ve learned a lot from the tips, advice and skills of the 30 days community. Drawn in a Zecchi Diario di viaggio watercolour sketchbook with a Micron 005 pen and painted with Zecchi Toscana watercolours. Day 28 in the Sktchy Challenge and today’s drawing tip from Charlotte Hamilton was not to be afraid of colour. Lol! Anyone who knows my work knows that I love colour and I especially love to layer colour up in skin tones. So this portrait of Amanda was an exercise in pure fun for me. 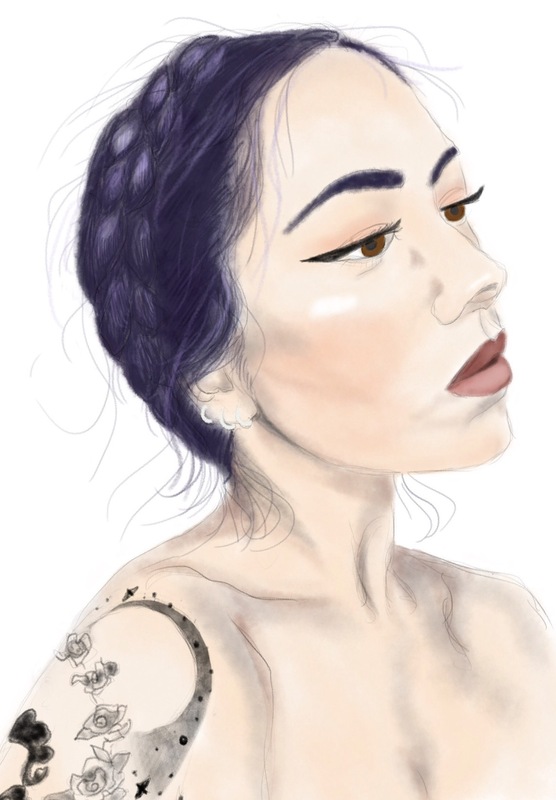 Today’s face: Santana, inspired by Sktchy. Santana is today’s suggested face for Day 27 of Sktchy’s January 30 Faces 30 Days Challenge. I subscribed to a Kickstarter Project by Joan of Art last year for a sketching tin and I received my tin this week. It has 3 half pan watercolours in it so I tried out the watercolours for this portrait. You could choose from a variety of red,blue & yellows – I chose the “earthy” trio, so this was painted with just these 3 earthy primary colours. Drawn in a Fabriano Venezia sketchbook with a Micron 005 pen and painted with Joan of Art Creations Earthy trio watercolours. Today’s portrait for day 30 of the #sktchy30 challenge is of Margot. That’s it, I’ve completed the challenge: I drew all 30 portraits, one for each day of April! This is the first time I’ve entered a challenge of this kind so I’m very happy that I completed it and met all the daily challenges along the way. Drawn on an iPad Pro with an Apple Pencil using the Procreate app. 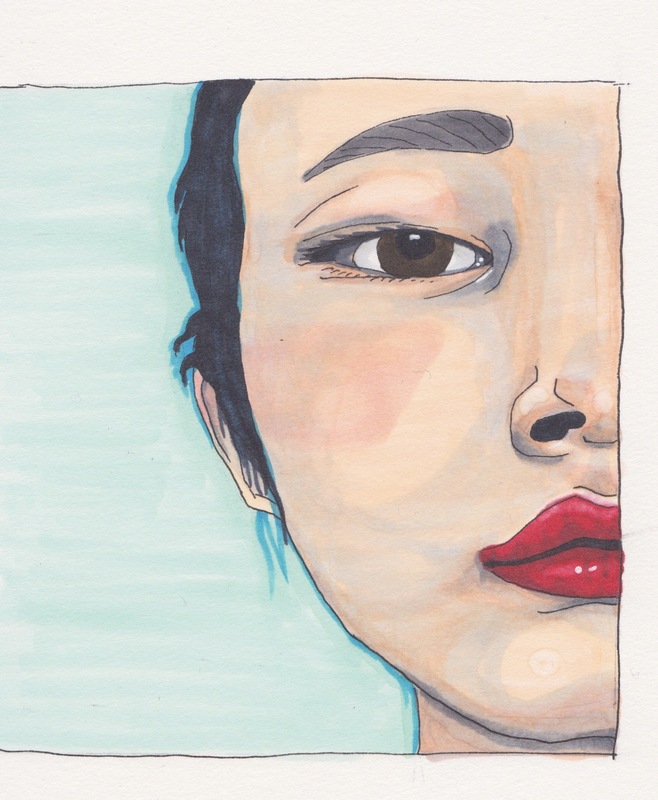 Today’s portrait for day 29 of the #sktchy30 challenge is MyHung. Drawn in a Daler-Rowney Ebony sketchbook with a Pelikan m200 fountain pen and Copic markers. 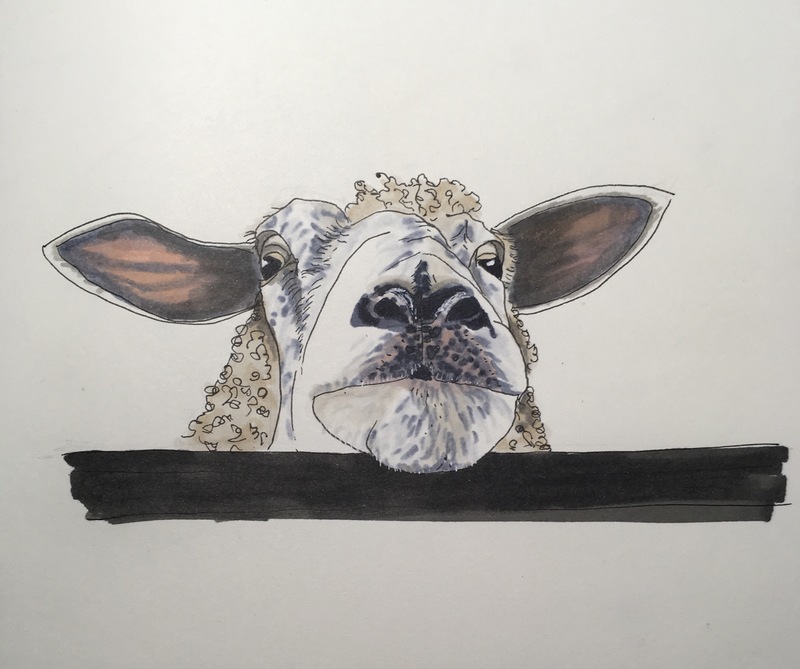 Today’s portrait for day 28 of the #sktchy30 challenge is of Christiane’s sheep. I chose to draw a sheep because at the moment I’m a participant in the Spring season of the Grow Wellbeing Project. That means that every Thursday I head off to the National Trust’s farm at Saddlescombe in the South Downs in the company of 12 other lucky participants and we spend the day with the Grow Project connecting with nature in a variety of ways that will support our wellbeing now and into the future. This week we spent the morning with Roly, the farmer at Saddlescombe, and his animals – mostly his sheep and newborn lambs. And yes, I did get to cuddle a newborn lamb. I’m lucky enough to have a couple of days at Saddlescombe with Grow before on Mind Live Project outings and so I’ve already cuddled the lambs, shepherded the sheep across the road and wormed a cow (yes, really!) and anyone who knows me knows that I love, love, love spending days with the sheep. So I thought I’d commemorate the day today with a sheep portrait. Drawn in a Moleskine sketchbook, a Unipin pen and Copic markers. BTW you can find out more about the Grow Project here, about the National Trust site at Saddlescombe here, and about the farm at Saddlescombe run by the tenant farmers Camilla and Roly, including the possibility to be a shepherd for a day, here.